Options for ablative facial resurfacing include chemical peeling, dermabrasion, and laser surgery. The popularity of dermabrasion has diminished because of an increased prevalence and awareness of blood-borne pathogens. Additionally, maintaining the proper depth during dermabrasion is technically difficult. Dermabrasion can be used for the treatment of facial rhytides; however, it is better suited for the treatment of facial scars. While superficial peeling agents (eg, glycolic acid) remain popular, they do not penetrate the dermis. A medium-to-deep chemical peel must be used to perform ablative resurfacing. However, the use of medium and deep peeling agents has diminished. This trend probably reflects the greater operator control that lasers provide. Laser skin resurfacing (LSR) has become an important component of rejuvenation surgery. The results in treating severely photodamaged skin, photoinduced facial rhytides, dyschromias, and atrophic scars have been favorable. In addition, LSR has been used for benign epidermal and dermal lesions and certain premalignant and malignant skin lesions. Finally, LSR can be performed as an isolated procedure or as an adjunct to procedures such as transconjunctival blepharoplasty (TCB), facelift, and endoscopic browlift. Currently, 2 laser wavelengths are in common use for facial skin resurfacing: pulsed carbon dioxide (CO2) and erbium:yttrium-aluminum-garnet (Er:YAG). The practice of combining these wavelengths in sequence is also gaining popularity. The latest generation of resurfacing lasers combines Er:YAG with subablative carbon dioxide energy in the same unit. The operative principles of these lasers and their use are described in this article. Although specific models with which the author has experience are discussed, the same principles apply to those from other manufacturers. Each Er:YAG pulse removes only 25-30 µm of tissue compared to the pulsed carbon dioxide, which removes 50-100 µm. The laser output of Er:YAG is directly absorbed by collagen and dermal proteins, whereas the carbon dioxide laser vaporizes extracellular water in the dermis. Each Er:YAG pass generates the same amount of ablation, whereas the pulsed carbon dioxide generates a decreased vaporization depth with each pass. Also, a very small additive effect of increasing thermal damage occurs with the number of passes; proportionately, pulsed carbon dioxide has more energy contributing to thermal damage per pass. The CO2 laser (wavelength of 10,600 nm) is absorbed by tissue water, causing the temperature of the water to rise to more than 100°C. The laser penetrates approximately 30 µm within the skin. Thermal injury is prevented when the laser pulsewidth is less than the thermal relaxation time of the tissue (the time required for 50% of the heat to diffuse). The critical pulsewidth is less than 1 millisecond. The first pass of the CO2 laser causes approximately 50-70 µm of ablation. Since the resulting layer of thermal necrosis has less tissue water than the uninjured skin, successive passes result in less tissue vaporization. With each pass, however, the total depth of thermal necrosis increases slightly. Keep in mind that the thermal necrosis does not exceed a depth of 100 µm if the pulsewidth is kept at less than 1 millisecond. Fluence (energy density) rather than peak power is more clinically relevant to tissue ablation because it is a measure of the energy (in J) delivered to the treatment region (in cm2) based on spot size. Increasing the fluence increases the depth of ablation. The threshold for skin vaporization is approximately 5 J/cm2. A fluence of 5-7 J/cm2 provides clean and efficient tissue ablation and dissipates much of the heat in the plume of vaporized tissue. The Er:YAG laser (wavelength of 2940 nm) offers precise tissue ablation with minimal thermal damage. This wavelength corresponds to the main peak of water absorption. When compared with the CO2 laser, the Er:YAG laser is more efficiently absorbed by water-containing tissues. Since the epidermis is mostly water, the Er:YAG laser is more superficially absorbed. This translates into less collateral thermal damage. Pulsewidths of 200-350 microseconds result in thermal necrosis of less than 10 µm in depth. Unlike the CO2 laser, with successive passes of the Er:YAG laser, the thermal injury depth remains stable. Additionally, stacking Er:YAG pulses slightly reduces the ablative efficiency. With the CO2 laser, the ablative efficiency decreases with successive passes. The vaporization threshold of the Er:YAG laser is between 0.5 and 1.7 J/cm2. The fluence and depth of tissue ablation are directly related. For every J/cm2, 2-4 µm of tissue depth is ablated. This allows for precise control of tissue ablation. The benefit of a combined system is derived from the precise tissue ablation and minimal necrosis of Er:YAG systems coupled with the favorable heating of deeper tissue layers typical of carbon dioxide systems. A distinct advantage of this laser is that the nuisance of oozing with Er:YAG alone is avoided with the addition of coagulative carbon dioxide effects. In addition, fewer passes are required to reach depths equivalent to those of Er:YAG alone. Carbon dioxide laser treatment followed by Er:YAG results in thermal necrosis and collagen injury similar to those of Er:YAG alone. This phenomenon may be secondary to Er:YAG removal of carbon dioxide thermal injury. In other words, following carbon dioxide passes with Er:YAG removes the zone of thermal necrosis and promotes prompt healing. 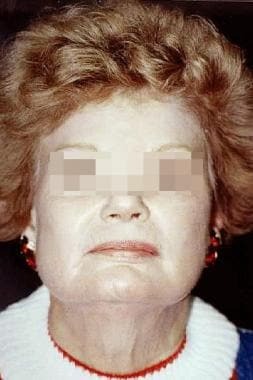 The images below depict laser skin resurfacing. In considering laser skin resurfacing (LSR), the clinician should consider the patient's skin type. This sun-reactive skin type (Fitzpatrick) is recorded preoperatively. Patients with Fitzpatrick type I or II skin are generally better candidates for LSR. Nonablative techniques usually offer better results to individuals with type III skin and greater. These patients are often at risk for postprocedure pigmentary changes. The carbon dioxide laser is well suited to the treatment of perioral vertical furrows, periorbital dynamic lines (crow's feet) and mild dermatochalasis, glabellar dynamic lines, actinic damage, generalized facial elastosis, shallow scars, and epidermal-dermal lesions. When treating crow's feet dynamic lines, ensure that the patient understands that the benefit is apparent only when in repose (ie, the furrows reappear upon squinting [unless botulinum toxin type A is also used]). The Er:YAG laser causes more superficial tissue ablation compared with the CO2 laser. Therefore, patients with actinic damage, dyschromias, mild photodamaged skin, or superficial rhytides are excellent candidates for Er:YAG skin resurfacing. An equally important factor is patient request for early recovery (ie, patients may want laser treatment but request that they not appear red for months). Unlike the carbon dioxide laser, Er:YAG appears safe for use on the skin of the neck, chest, and hands, which expands its role. Additionally, a decreased incidence of hyperpigmentation with skin types IV and V may be associated with use of the Er:YAG. 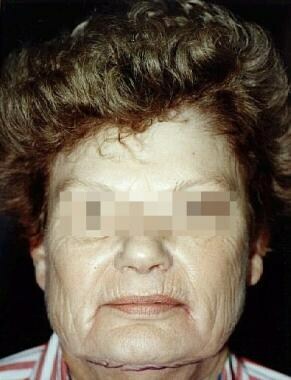 The patient's wrinkle severity is classified preoperatively. Regions are graded on a scale of 1-6 (1 means essentially unwrinkled; 6 is profoundly wrinkled). Repeat treatments may yield the most optimal results. Treatment for patients with severe rhytides should be planned in this manner. Retreatments are generally spaced 4 months apart. Absolute contraindications include active acne, deep acne pits or picks, and isotretinoin (Accutane) use in the past 2 years. Accutane is effective for cystic acne because it targets the sebaceous glands. However, a compromise in gland function impairs skin reepithelialization and increases the risk of scarring. Similarly, patients with reduced adnexal structures (eg, scleroderma, irradiation or burns) are poor candidates. History of herpetic infection is a relative contraindication only because most patients do not know their true status. Smokers are not excluded, which is a clear advantage over standard rhytidectomy. El-Domyati M, Abd-El-Raheem T, Medhat W, Abdel-Wahab H, Al Anwer M. Multiple fractional erbium: yttrium-aluminum-garnet laser sessions for upper facial rejuvenation: clinical and histological implications and expectations. J Cosmet Dermatol. 2014 Mar. 13 (1):30-7. [Medline]. West TB, Alster TS. Effect of pretreatment on the incidence of hyperpigmentation following cutaneous CO2 laser resurfacing. Dermatol Surg. 1999 Jan. 25(1):15-7. [Medline]. Kohl E, Meierhofer J, Koller M, et al. Fractional carbon dioxide laser resurfacing of rhytides and photoaged skin--a prospective clinical study on patient expectation and satisfaction. Lasers Surg Med. 2015 Feb. 47 (2):111-9. [Medline]. Wright EJ, Struck SK. Facelift combined with simultaneous fractional laser resurfacing: Outcomes and complications. J Plast Reconstr Aesthet Surg. 2015 Oct. 68 (10):1332-7. [Medline]. Scheuer JF 3rd, Costa CR, Dauwe PB, Ramanadham SR, Rohrich RJ. Laser Resurfacing at the Time of Rhytidectomy. Plast Reconstr Surg. 2015 Jul. 136 (1):27-38. [Medline].